This week, something a little different that was so much fun: Our little Dinner and a Movie Supper Club met at our house. I hated the movie (very graphic documentary…sorry, Jackie, but I lean toward a different kind of mating ritual in the form of romantic comedies! 🙂 ), but decorating the table to go with the movie’s theme was a blast! So, without further ado, I give you March of the Penguins! Grownups want to have fun every once in awhile, too, so I wanted this tablescape to have some youthful features with an adult flair. Predominant colors of the evening: black, white and goldenrod (which is fancy talk for yellow!). A snowy white cotton linen was the foundation for the table. A jolt of color was presented in the form of goldenrod placemats (Bed, Bath & Beyond) turned lengthwise for an elongated effect. 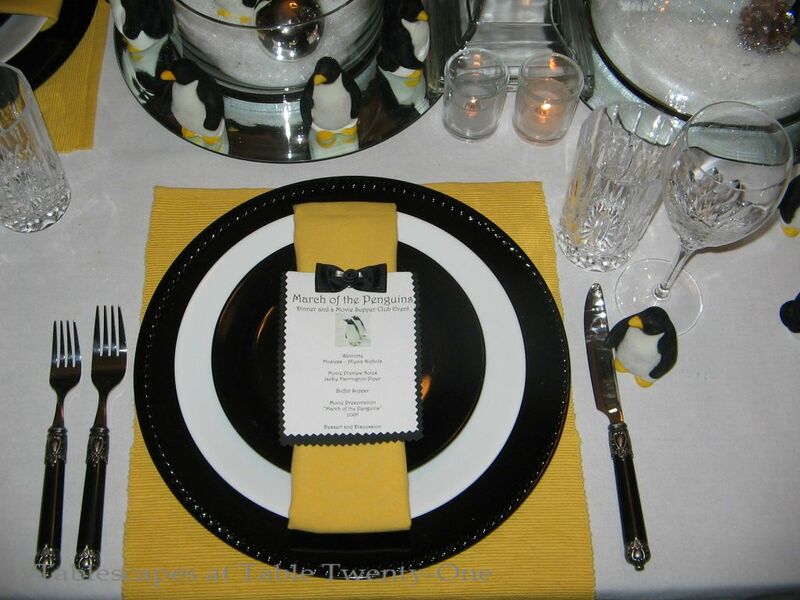 A black acrylic charger, plain white dinner plate and solid black salad plate were then topped with a goldenrod napkin. Sophisticated black flatware and Godinger crystal rounded out the setting. Using my computer and a pair of decorative edge scissors, I created a program for each guest so they’d know what was in store for the evening. The black bow ties were very inexpensive from a clearance rack at Hobby Lobby a couple of years back. I just glued them on to each program with a low-heat glue gun. Glass cylinders are so great for all kinds of displays! I have them in heights varying from 3 to 31 inches!!! For this tablescape, I used an 11″ x 9″ in the center flanked by two 4″ x 8″. 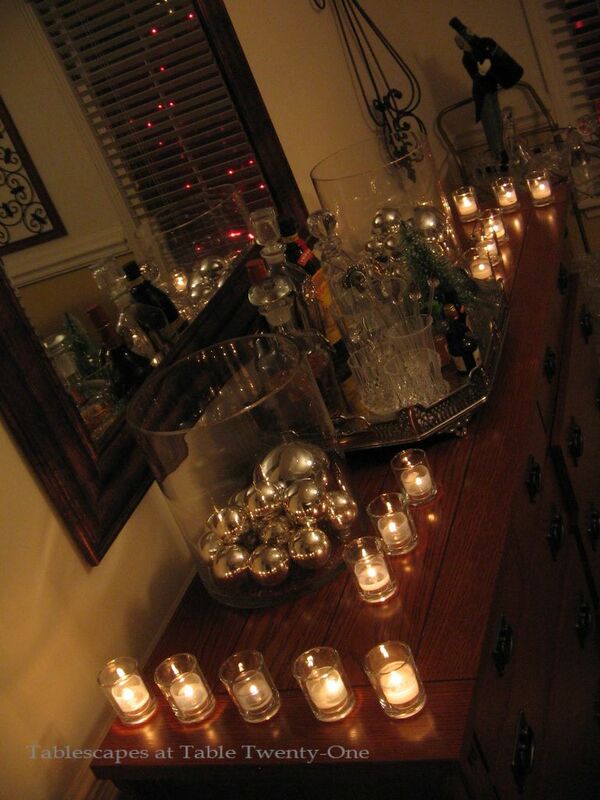 Each was placed atop a 14″ round mirror that gives the illusion of an icy pond. 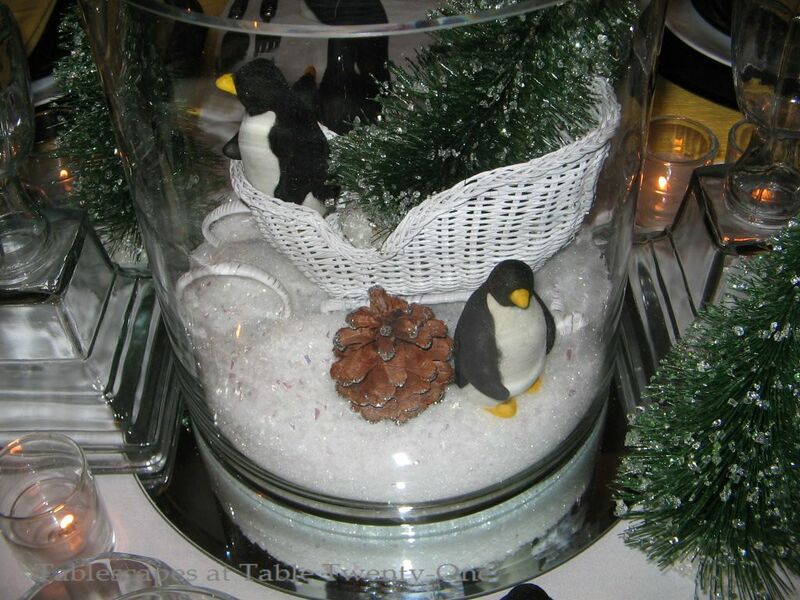 I filled them with a couple of inches of faux snow for a wintry effect, then dropped in penguins, pinecones, bottle brush trees, and shiny silver balls. (I always toss a little iridescent glitter in with the “snow” to give it a little more sizzle!) The taller cylinder was large enough for a white wicker sleigh with a penguin and his Christmas tree along for the ride. Having researched the yearly mating journey of penguins, I decided to mimic their colonies by using them in great numbers all over the table. These pretty little bottle brush trees only stand about 6″ tall, but they pack a big punch with their shimmering branches that glow by the light of the votive candles. 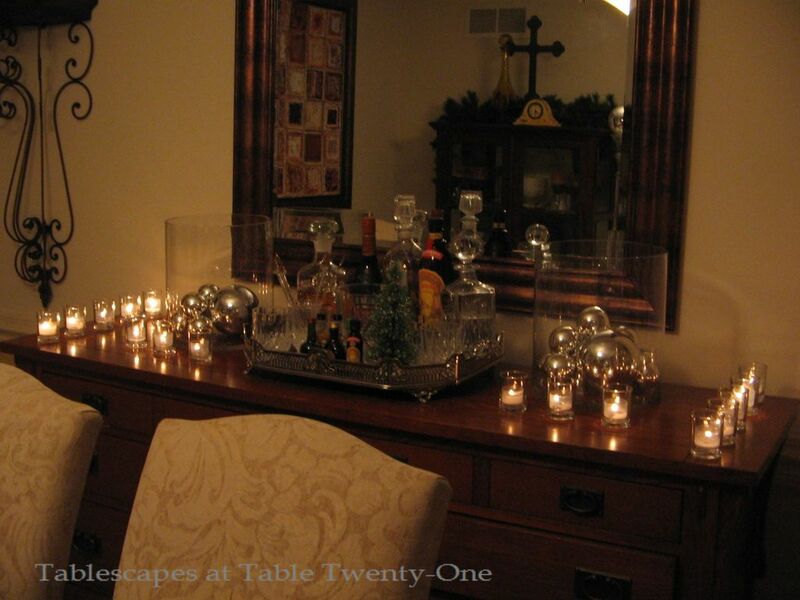 Tall glass candlesticks topped with shiny silver balls lend height and additional shimmer to the tablescape. Of course the buffet had to get a little special treatment, too! There’s almost no such thing as “too much candlelight.” Grouping them en masse like this gives an unprecedented look to any tablescape. (They also flatter every skin tone and make everyone look fabulous!) 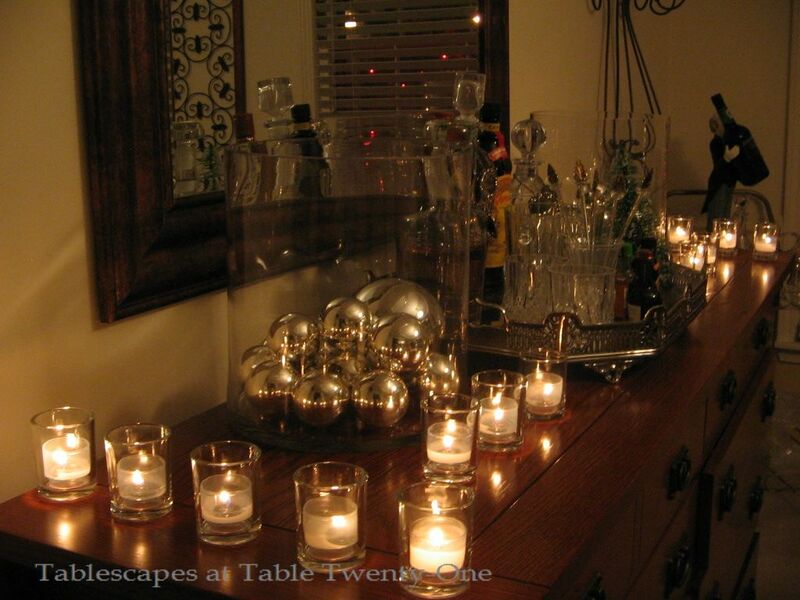 These votives, lined up on 3 sides, softly illuminate the silver balls in the glass cylinders and all the lovely cut crystal on the after-dinner drink tray. The supper club wants to meet here again next month. We’ll see! 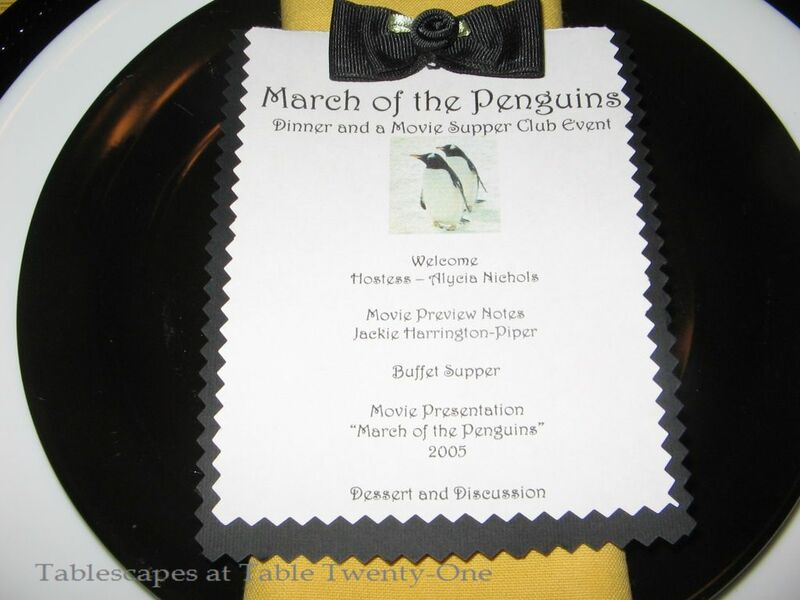 To see all the photos from the March of the Penguins tablescape, please click here or on the “Winter” tab above! 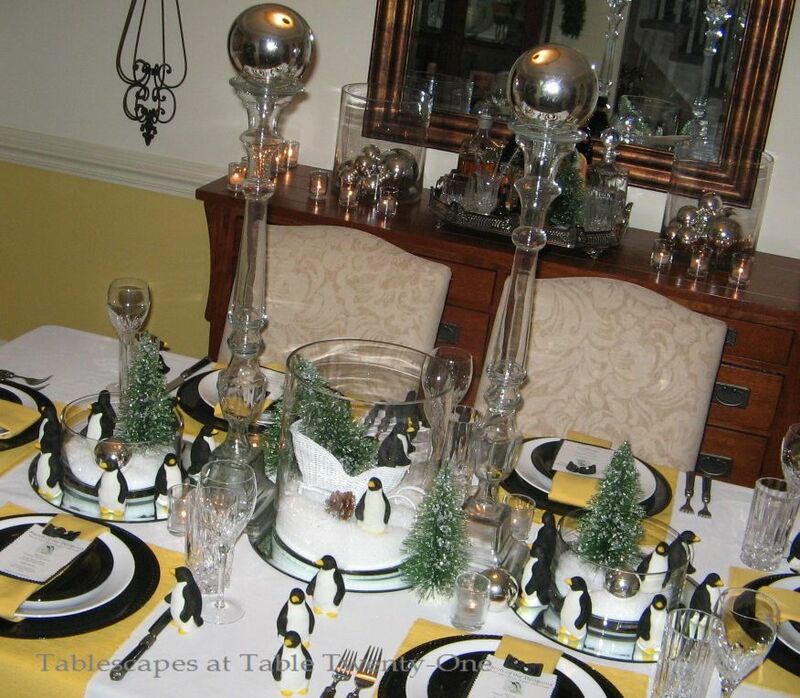 This week I am again delighted to join Susan and all the other incredibly talented tablescapers for Tablescape Thursday! When you’re finished here, pop on over and check them out! Cute, cute CUTE!!! I thought the Frosty theme was my fav. This one wins hands down! 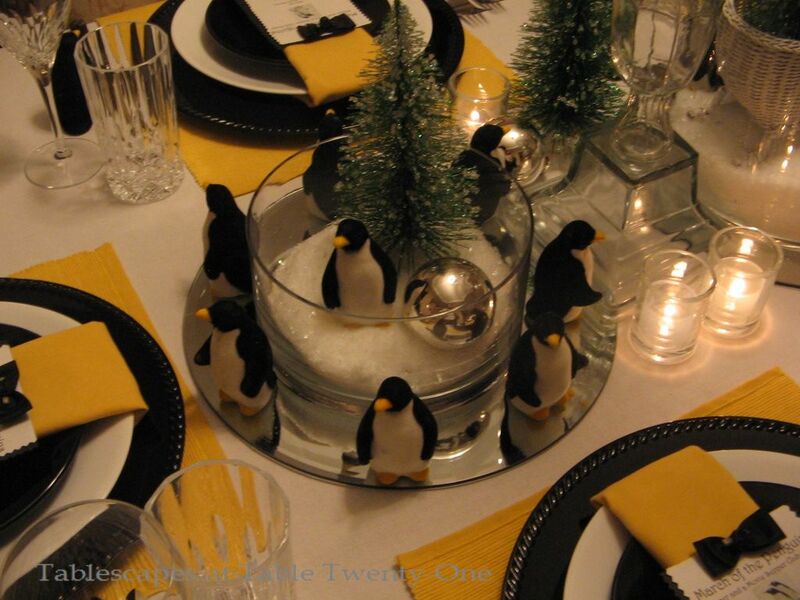 I must inquire…where did you find the penguins? They are adorable! Hey there, Mona!!!!!! I hope you had a good week. I’ve thought about you and yours. Hope all is well in your neck of the woods! I found the penguins at a wholesale place several years ago when I had my store. I bought them (40 of them!) without any clue as to how I might use them in the future. They were at such a good price that I couldn’t resist (25 cents each!). So…the evening’s movie turned out to be perfect for this setting! So first you thought the Frosty was the best and now you’ve switched? So this means I’m going to have to work really hard next year to top this!!! 🙂 I wish you the very best of the New Year, my sweet! Be safe! This is so adorable — love those perky pengins! Love them marching all over the table. Hi, Martha, and thanks! Happy New Year to you! OOOh Alycia!!! Cool!!! I want to join the dinner and movie group. Wherever did you find all those penguins? This is incredibly delightful for all who came, I’m sure. I would have had a blast had I been there.. I love your creativity and the ability to carry it out to the end. Great fun. Happy New Year to you and yours, may the new year bring lots of blessings! This is an unprecedented “wow”! An unqualified “amazing”! An unbelievable success! You hit it out of the ballpark with this one, sister! Thank you, Linda! I really tried to do something kind of different and fun. I needed something a little different than all the red I had going on in and around the house for Christmas! Have a great New Year!!! Thanks for stopping by and for being so sweet! This is so cool! I just love it. You’ve somehow managed to create something whimsical yet, at the same time, elegant too! This is just super. I am crazy about it and have bookmarked it to steal a few ideas for next year. Thanks! Glad you like it, Denise! It was fun to do and I hated for the dinner to be over. Oh, well…there’ll be more! Have a great New Year! This is just the most creative table! I just LOVE your creative flair and panache! 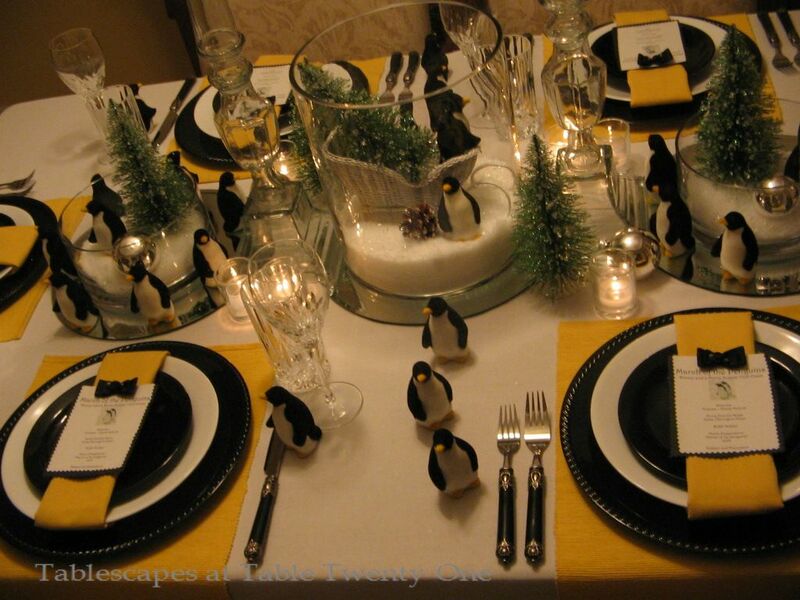 Those little penguins are so chic and you built a classy table around them. What a delightful stop! LOVE this! It is so fun! 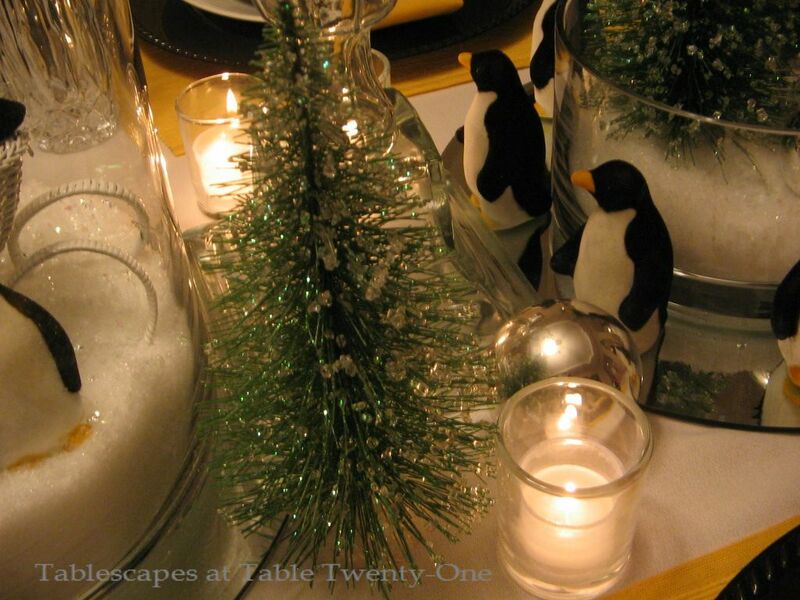 Creating the little scenes with the penguins and trees makes for a very interesting tablescape! And the fact that it “matches” the name of your movie is unbelievable! You must have been so glad you bought all those penguins and trees! Alycia, this table is absolutely wonderful. I love your creativity and appreciate the inspiration. I remembered the cozy moment when I visited Australia awhile ago. We visited southern coast of Victoria to watch the smallest penguin in the world. What a memory & you give & a smile in my face when I see your lil penguins. TY a bunch for sharing and of course your settings is the cutest. Hope you had a great Yuletide 2010 & a peaceful NY to come. Loved your penguins. So cute and fit the theme . Hope you and yours have a Healthy and Happy New Year. Thanks, Donnie! Same to you and your family!!! I just adore your imagination and creativity! It’s always fun to visit because I never know what I will see! Happy New Year! Thank you so much by Scribbler friend! Happy New Year to you and yours!!! 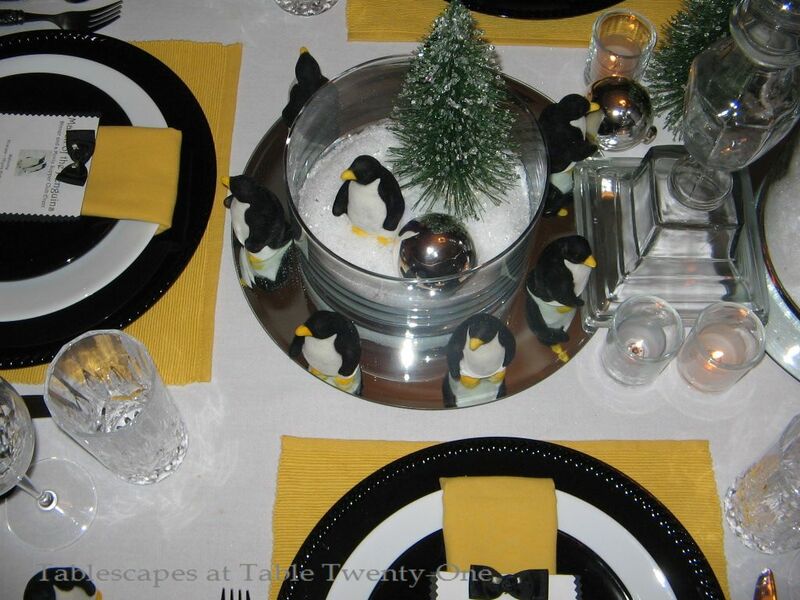 Alicia – your tablescapes are amazing. I am so glad I found your blog – I am your newest follower! I especially like your progressive dinner – what a fun evening. Your designs are terrific and I can’t wait to see more!Thanks for coming by to see me. Why, thank you, Miss Merry! I’m glad you found my blog, too!!! I’m always so happy to hear from new guests! I hope to bring lots more in 2011, and I always enjoy feedback. I hope you and your family enjoyed a peaceful and happy New Year, and I look forward to “seeing” you in the coming months!! !